My Flipside friends and I have amended the starting point for rides to the Guthrie Corridor Expressway and on to Kampung Sri Kundang etc. The ride to the GCE now takes us past Sultan Abdul Aziz Shah Airport. I remember it fondly as Subang International Airport. It was Kuala Lumpur’s main airport from 1965 to 1998. The original Subang Airport terminal building is long gone, which is a shame. It has been replaced by a less attractive, albeit modern, terminal. Today I decided to ride to the airport that replaced Subang. The Kuala Lumpur International Airport (KLIA), and the newly opened KLIA2, which is a low cost carrier terminal. The first part of the ride was along the Maju Expressway (MEX). The first time I rode along the MEX, I thought it would be my last. There is one particularly tricky section, the Kuchai Lama Interchange, on the ride back to Kuala Lumpur. The fact that the MEX is just about the only reasonable ride I can start from my doorstep, and it gets me to the KESAS Highway without having to drive there, now outweighs my nervousness about that interchange. Now I am pretty familiar with the entire 26km / 16 mi length of the MEX. MEX is mostly elevated from the on ramp at Jalan Tun Razak to the Bukit Jalil National Sports Complex exit. That means parapets and drainage gratings along both sides of the roadway. Which makes for a fairly narrow shoulder to ride a bicycle on. Once you get past Exit 2004 the parapets and gratings disappear. More importantly there is much more of a shoulder to ride on. Or walk on, as the case may be. The new bit on this ride came after the Putrajaya Toll Plaza. Most times I take the u-turn under the expressway and head back home (in red below). This time I cut across to the right hand exit to get onto the Putrajaya Link (in green below). This 8.8km / 5.5mi road links the MEX to the North-South Expressway Central Link, also known as the ELITE Expressway. I was on the ELITE for about 10km / 6mi before exiting onto the KLIA Expressway. From there it is about 15km / 9mi to the KLIA. I rode up to and past the Departure Hall of KLIA before looping over the KLIA Expressway to get to the Departure Hall of KLIA 2. This is the road through the departure level of KLIA. I had planned to stop at KLIA 2 for a coffee and some food. Only to be told once I got there that bicycles are not allowed into the airport buildings. I rolled my bike into the Departure Hall anyway, and bought a coffee. Much to the consternation of airport security, who sent five people to intercept me as I left Starbucks. They were nice enough about it, but I did have to sit on a bench outside while I drank my latte. On the ride back along the ELITE I passed a vehicle like this that was parked on the road shoulder. PLUSRonda is the team that patrols the Expressway and provides assistance to motorists. A few minutes later I heard a beep behind me. it was the PLUSRonda guys, with the blue lights on the truck flashing. They told me that bicycles are not allowed on the ELITE. I asked them to let me ride the remaining 8km / 5mi to the exit to the Putrajaya Link. They were dubious out of concern for my safety, given the heavy and fast traffic. They agreed to let me ride on, and followed behind me, lights still flashing. I felt compelled to ride faster until I got to the exit. The furore with security at KLIA2 had distracted me from buying anything to eat. I also made the mistake of ordering a hot latte rather than an iced one. Which I didn’t finish because I was hot. So I shouldn’t have been surprised that I bonked on the Putrajaya link. I made it up the first of the MEX climbs to the toll plaza, but I had to stop for a breather. My arms were tingling. A sure sign of hypoglycaemia. I had 6km / 4mi between me and the Seri Kembangan R&R. This is the elevation profile for that section. So you can understand my relief when I crested that last slope and rolled down to the R&R in the distance on the left. I felt much better after an ice-cold Sprite and a short rest under a fan. 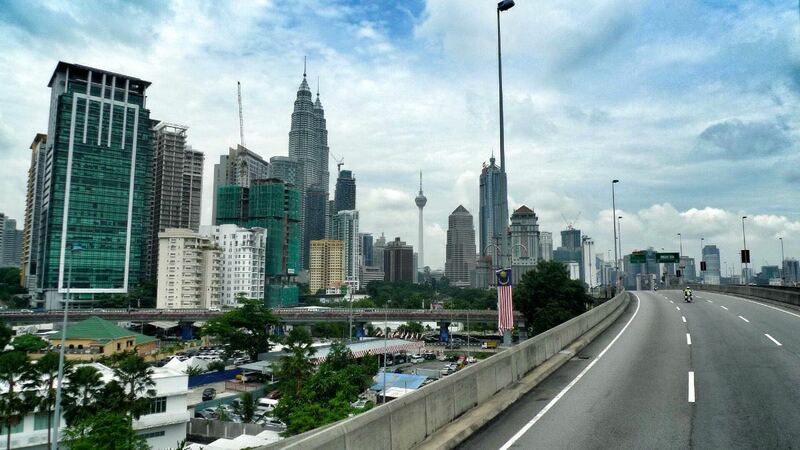 With blood sugar levels restored, the rest of the ride back into Kuala Lumpur was fine. Even that Kuchai Lama Interchange and the elevated parta. Posted in Cycling in Malaysia and tagged ELITE Expressway, Guthrie Corridor Expressway, Hypoglycaemia, Kampung Sri Kundang, KLIA, KLIA2, Maju Expressway, PLUSRonda. Bookmark the permalink.